As a newlywed of a mere 6 month, I have lots to learn about marriage and want to have an attitude of humility that invites older, wiser women to counsel, correct, and encourage me as a new wife. Titus 2:3-5 is a beloved verse for me because it reminds me of the pattern that Paul encourages for Christian woman: Older women reaching out to younger women. I believe these words means that God wants us as His daughters to stick up for one another, encouraging, instructing, serving, and even lovingly correcting one another so that we can daily look, act, talk, and love like Him. (Click HERE for my recent post, 10 Ways Older Women Can Encourage Younger Women). If you could ask an older, godly married woman one or two questions relating to marriage or motherhood, what would you ask her? 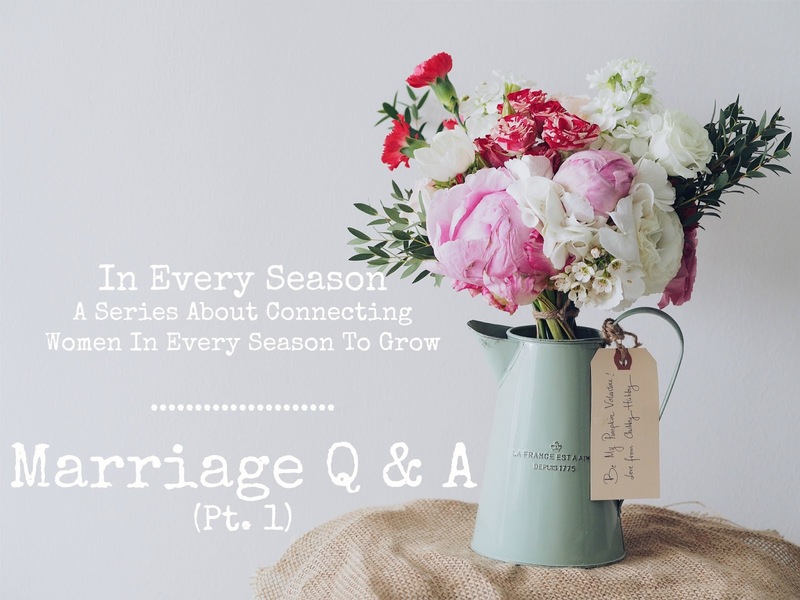 The responses to this question from the young married women were multi-faceted, with a variety of different topics that were brought up. I compiled the questions and decided to find several women with 10+ years of marriage (all of whom were also mothers) who could share their wisdom in responding to these questions on marriage and motherhood. I used email and Facebook to contact a few women in my life who I respect greatly as wise Christian women and I also posted about this in The Peony Project's Facebook page. (For those who are unfamiliar with The Peony Project, it is a wonderful online community of Christian blogging women of all seasons of life who support each other through prayer, sharing practical blogging advice, and reaching out to discover new bloggers who they otherwise may have not heard of.) Total, there were nine ladies who formed this panel, and I am so thankful for their wisdom in responding to a lot of the questions and their willingness to step in the role of the Titus 2 women! 1. What is most impactful to a husband for his Spiritual growth? "Prayer! In the early days of marriage I deemed myself the Junior Holy Spirit and took on the role of passing out spiritual nuggets and even correction to my husband. It worked just about as well as you can imagine. Ha! Over time, I learned that the power of my prayers was far more valuable to my husband than my advice or correction. I found that the less I said and the more I prayed, the greater the growth I saw in him." "Hands down, the most impactful thing I have ever done for my husbands spiritual growth was finally realizing I am not his holy spirit. I was constantly trying to guilt him in to spending time with Jesus or taking a more authoritative role in the spiritual aspect of our family and all that did was create tension and frustration for both of us. One day, the Lord spoke so clearly to me to stop trying to brow-beat him and simply pray for him. Amazing the way the Lord does such a better job at conviction than I do. Not only that, but it showed me areas I was certainly needing to grow in also. When we take our husbands to the throne room and leave them there, God can do amazing and unimaginable things. "You as a wife are NOT responsible for your husband’s spiritual growth. You can and should pray for him- pray God’s word and promises, protection and mercy over your husband- but never assume responsibility for your husband’s spiritual growth- that is between your husband and God. You will naturally become a beacon and inspiration to your husband and children by growing closer to the Lord yourself." 2. How do I respect my husband and his authority when I don’t agree with his decisions? "God tells us to submit to our husbands (II Peter 3:1, Titus 2: 3-5). In the ideal situation, a husband will consult with his wife on major decisions and together they can come to a decision after prayerful consideration of the matter. This is not always the case in young marriages and many times the wife may think she knows more about the situation than the husband. Not agreeing with the decision can cause disagreements and sometimes major breakdowns in communication between the wife and the husband. We have to realize that God knows best when telling us to always submit to our husband’s decisions, no matter how informed we feel we are about the matter. Our husbands are held accountable by God for their decisions concerning their families. (I Peter 3:7, Titus 2:2) We need to always show support to our husband in not only the big decisions but also the smaller ones. If we respect them and show them we will support their guidance for our family, the relationship will grow and blossom. You build this support by asking God to help you be a submissive wife and to guide your husband in all his decisions." "Is he going against God? If your husband is going against God’s laws, then you are responsible for putting God’s word first in your home. However, if your husband is merely making decisions you don’t like, but your husband is not going against God’s laws- then you must respect his decisions. You can speak to him about them, about your feelings towards these decisions- but ultimately, you must submit with respect and love- Pray about your feelings towards these decisions/ authority, pray for your husband to seek God in all his ways- and again, TRUST God to work ALL things & allow God to do so." 3. What are the top 3 lessons you've learned about effective communication? "To hold my tongue until after I have prayed and sought the Lord. Not to assume my husband has it all wrong and doesn't understand. To understand between us what our mission is for this marriage and family." "I just have one big one (for us anyway): Don't assume you understand what your partner is saying. Ask. Repeat what you heard. Let him/her correct you. Keep it up until you truly understand. So many fights are because we interpret what our spouse says in the wrong way." 4. What is your best advice for a strong marriage? "Work hard. Like really really hard. Marriage has lots of ups and downs. It is unlike any other relationship you will ever have. The sappy feelings you start your dating relationship with are not enough to carry you through years of dealing with finances, moving, raising children, jobs, etc. You will face periods where you just have to look at each other and commit to doing better. Know that when you come out of those times you'll both be stronger and your union will be stronger." "Best advice is communication, commitment, respect and grace one toward the other. Date nights at least monthly but hopefully a little more often and marriage retreats every 6-12 months are great vehicles to have that transparent communication. I'm currently joining in a 30 day challenge to strengthen my marriage over at THIS FB page . I know you'd be welcome to join." "Recognize that you have been given a sacred trust. To become one with another person means you are privy to their innermost parts, shortcomings, failings…don’t betray that trust. Don’t ever sell out and tell anyone else the things you know about your mate only because you have become one flesh. Pray for your mate always, but don’t tell others things you know about them that would shock or hurt others. I am not talking about pretending you have a perfect marriage or not sharing about general conflicts, etc. I am talking about keeping close in your heart and trust the things that have been unveiled to you alone." Wonderful post! So important for us to learn and grow from one another. Thank you for the opportunity to be a part of this! I love the way this came together. So much wisdom! Thank you for letting me be a part of it!